BabyNaturopathics.com - Organic Cotton Baby T-shirt With Wheat Embroidery By Baby Naturopathics - Baby Naturopathics Inc.
You can earn 13 bnReward Points on this product! This design is one of our bolder styles. 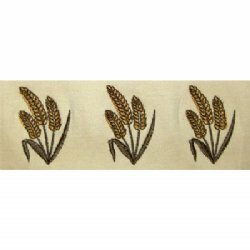 It consists of four embroidered blades of wheat running along the front of the shirt. 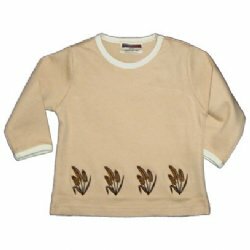 In addition, the back of this infant top is adorned with our embroidered 'organic cotton' leaves logo. This baby top is made of thick (230g) and luxuriously soft cotton. Organic dyes have been used to color the cotton, except for the borders which are made of naturally colored (undyed) organic cotton. Available in three smart shirt colors. This infant tee is certified by SKAL.